During our panoramic tour, we will explore the West Mainland of the Orkney Islands, the location of one of the largest concentrations of prehistoric sites in Great Britain and a World Heritage site. We leave Kirkwall harbour and head for*Skara Brae, one of the most fascinating and best preserved Neolithic villages in Northern Europe. 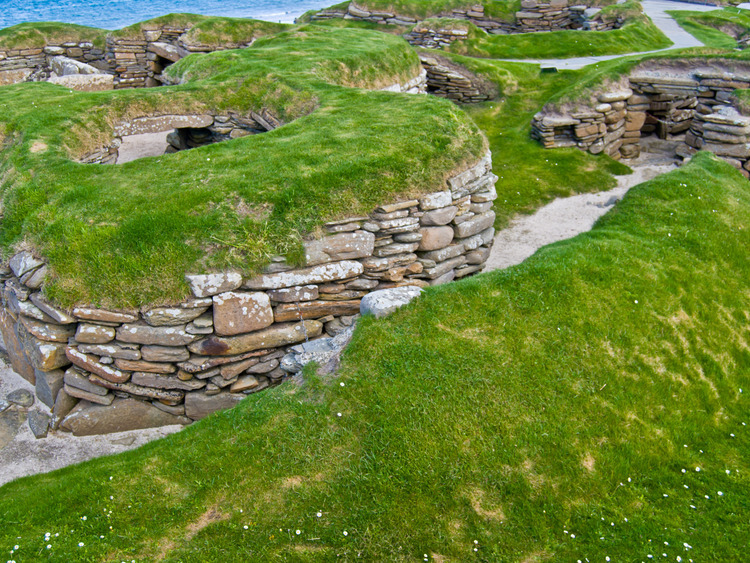 It is part of the **Heart of Neolithic Orkney*, a site selected by Unesco as a World Heritage Site in 1999. Situated next to the half-moon, sandy Bay of Skaill, this Neolithic settlement was completely covered by sand for thousands of years, until it suddenly came to light during a violent storm in 1850. Looking at the village, you have clear idea of its structure centuries ago and if we look closely at the houses, we have a unique vision of how our ancestors lived. Next to the archaeological site lies a very interesting Visitor Centre, which houses the artefacts found during the excavations: work tools, beads, pottery, and objects made of whalebone, dating back to a period of approximately 600 years of occupation, based on a maritime economy. Only a few steps away stands the most beautiful manor house in the Orkney Islands, Skaill House, built in 1620 by a powerful bishop. Today, it is one of Orkney's major attractions, housing numerous interesting artefacts. We return inland, across fertile, agricultural land and hills, and pass in front of the Ring of Brodgar, the third largest monolithic stone circle in the British Isles. We will pass by the Standing Stones of Stennes. Dating back more than 5,000 years, this archaeological treasure is one of the oldest stone circles in Great Britain. At the end of our excursion, we make our way back to our ship, moored at the Port of Kirkwall. From the coach to Skara Brae village and from Skaill House to the coach park is an easy walk of approximately 800 metres, but it can be exposed in bad weather.